Titanic  No Joke Art Dept.  3D Scanners  SnowMaker  and more! Please fill out our questionnaire -- give something back. 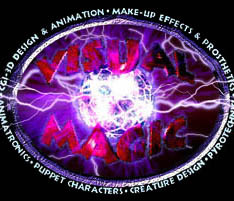 To receive email when Visual Magic is updated, simply fill out your email address in the form below. Please note that you must fill out your full, correct email address and if a message of verification is not received within 24 hours then you must have misspelled it. If you change your email address please notify us and we will alter it for you. When you hit "SUBMIT!" this page will reload and a message of confirmation will be on its way to you. Thank you for filling out the form.